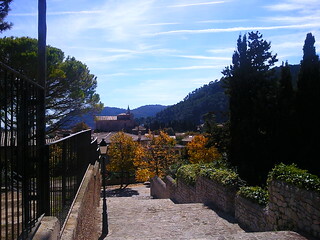 Valldemossa is only 12 miles from the island’s capital Palma, in the valley of Sierra de Tramuntana. The village can get pretty busy with coach loads of day trippers from cruise ships docked at Palma and Palma residents wanting to escape the city. However it is still a charming village, especially if you manage to visit at a less busy time. If you come by car, most of the village has meter parking in the streets but if you drive further up the hill, there is some free parking. 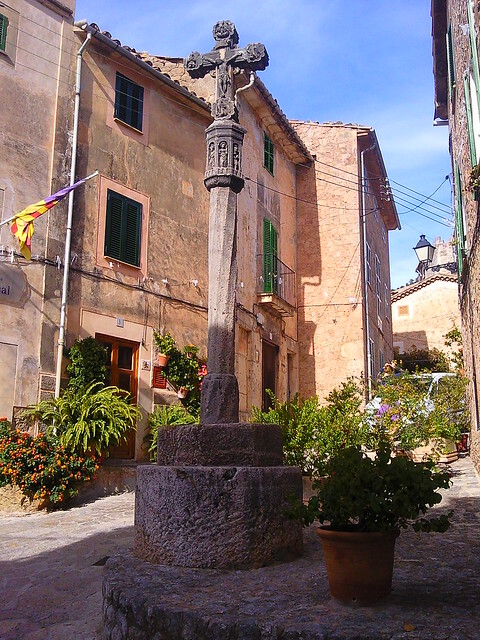 The village is probably best known for the stay during the Winter of 1839 by the composer Chopin and his lover Georges Sand, a female French writer, in a cell at the Valldemossa Charterhouse. The former monastery is now home to the Chopin Museum, as well as a 17th century pharmacy. There’s a Chopin Festival in the village every August. 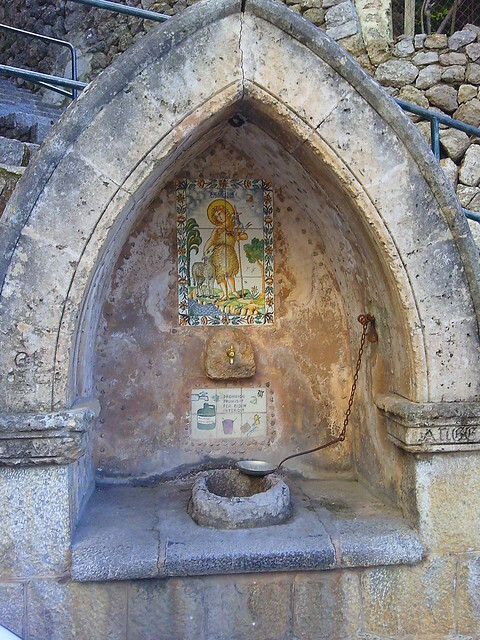 The two main festivals in Valldemossa are Santa Catalina Tomas in July, in honour of the patron saint of Majorca who was born in the village and San Bartolome in August. There are plenty of cafes and restaurants in the village, some with views over the surrounding countryside. There’s a market on Sundays. 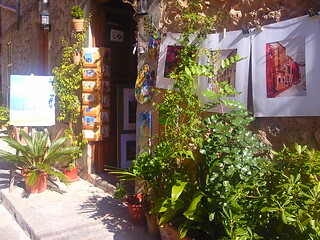 Valldemossa is full of interesting shops. 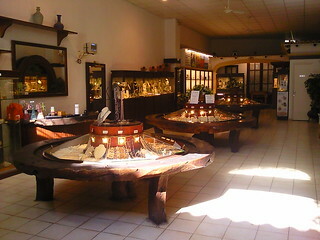 The jewellery shop in the photo below had it wares attractively laid out on large circular wooden tables. You can buy original art in some of the shops. Puerto de Valldemossa lies around 4 miles north of the village, down a pretty windy road and has a small pebbly beach. Deia, a lovely village east of Vallemossa, makes an ideal day trip destination. I enjoyed the walk up to cemetery, where the British writer Robert Graves in buried, as there are many beautiful paintings on tiles embedded in the walls all along the walk. If you’re feeling energetic you can walk down to the coast at Cala de Deia . You can also drive down but you have pay to park. There’s a cafe at the Cove but it was closed when we were there in October as there were waves crashing onto the outdoor seating area.